We are not a puppy farm or kennel. All of our pups are born inside our home. We only have one or two litters at anytime which enables us to spend a lot of quality time with our puppies and give them a lot of individual love and attention. They are great time wasters and you can often see our family sitting watching the TV with a puppy under their arms! 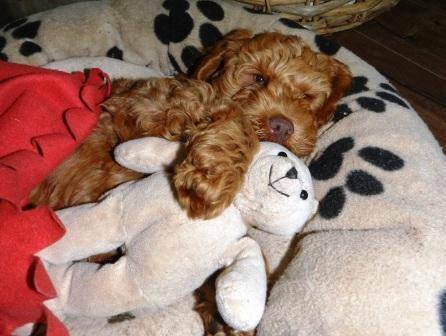 Our puppies are socialised with children and adults and when they are old enough they spend time with our adult dogs. By the time they are ready for their new homes, they are very used to family life and are confident and happy puppies. We believe it is important that puppies are raised in an environment where they are exposed to the usual smells and sounds of busy family life as well as lots of love and positive attention to prepare them for their lives with their new families. We are constantly receiving letters from buyers who tell us that our puppies are so cuddly, well adjusted and confident. We place great importance on placing the right temperament puppy with the right family, which is why we ask you to complete our Expression of Interest. We love our puppies and are very keen to find families who will give them the same amount of love and care and who will commit to spending quality time with them.